New full responsive Professional Material Design theme with Unlimited colors and a lot of different options. This theme you can use if your site is for users: from several countries, one country or one city. You can select unlimited colors with Color Picker ( Primary color, Second color, Publish ad button color and hover for this button). 5. Enable/disable City input from advanced search. Custom Welcome text in Main Page. Text paste in theme settings or disable. Blocks in main page for Text. These blocks can be used for seo text. Or it could be text for visitors. Text on category pages. These blocks can be used for seo text. Or it could be text for visitors. 10. 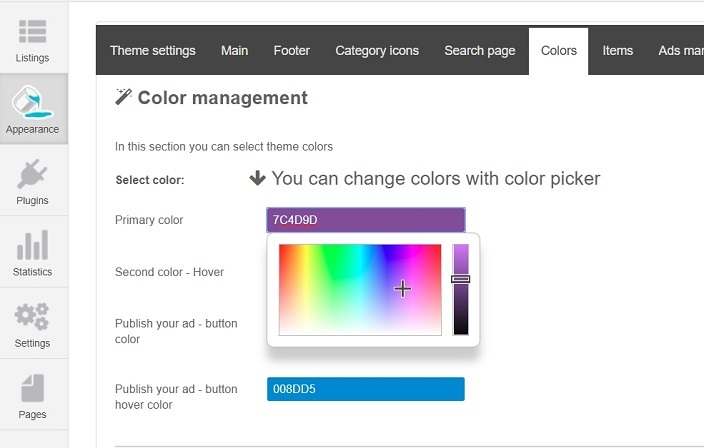 Advertise Managment from theme settings for platforms, such as Google Adsense. 12. Gallery and List View. The administrator can choose - as will be shown by default. 13. Custom background images for main page. Now you can upload/replace background image from theme settings. 14. Custom copyright in footer from theme settings. 15. Widgets in footer. Here you can insert any widget that you want, or just text. Can be replaced (or upload for new categories) from theme settings. 17. Disable/enable mark as and useful block in item page. 18. Disable/enable categories in main page. 19. Very Easy to install.No need edit the code. No need plugins to install theme. 20. Google Map with clusters for main page and search page. 21. Google Map for item page. 22. Translated: English, Spanish(Spain), Portuguese(Brazil), Portuguese(Portugal), Russian, German, French, Italian. 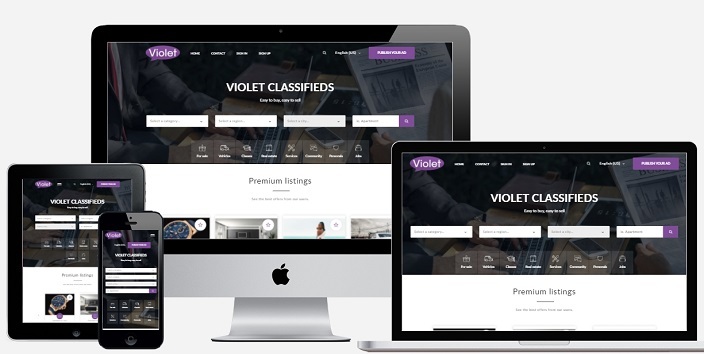 Violet Theme is a very cool, modern, professional and usefull theme made by Dis. It's doing everything what I expected with my project. There is few bugs that I needed to solve with a little help from Dis, the developer. Dis has been very nice doing some tips and helping me with the theme. Excellent design, modern and professional that includes Google Map on the home page and the search page. Very easy to configure. It is a good choice. I have a question, can we have a google map section on search page ? like airbnb style ? (map on left, and item on right) ? Hi. Yes, you can use the google map on the search page. This option you can enable in theme settings. But the map will be at the top, after the header, the full width of the page. And on this map will be all the items from the current search page(style like in main page google map). Could you add it on the live demo, I tried via admin but it's restricted. No. Did you read, what is written here before sending a message ? - "Your reply will be public. Do not publish any personal or contact data, it will be removed"
A great looking theme. I am happy to see it. Very modern. Everybody in america are used to thousand separators but no themes really support that. I guess I could edit some code but I really don't want to. The location on the thumbs would be nice instead of brief description. Have you added any more function to custom fields? I'm glad that you liked the Violet theme. All the functions available at this moment, you can see in the admin demo. In the future, I plan to add new features. HI. Sorry, but so far there are no discounts for this theme. Please, could you enable the google map on search page ? I tried via admin panel, but it's say that it cannot be done as it's a demo version. Olá, gostaria de saber se é possível exibir 2 anúncios ao em vez de um na primeira página nas duas categorias para versão de celulares e smartphones? Please write only in English. 1 - The carousel of ads: Premium, Latest and Related - can slide automatically? 2 - The carousel of ads: Premium, Latest and Related - are random? 3 - The ads on the home page: Premium, Latest and Popular - are random? 4 - Ads on the homepage can be shown in list and random mode, by default, according to the website administrator's choice? You can look the Live demo and Admin demo. 1. Yes. This is Owl Carousel and she can work with autoplay. But for this need ad in main.js autoplay: true in owlCarousel settings. 2. Premium and Latest items by date. Popular items by views. 3. Premium and Latest items by date. Popular items by views. I will do this, buy the violet template and send a ticket. I liked the theme. Great Work! Cheers. I want to buy the theme but i have a query. Can you make the phone number field mandatory on signup page? I will not make the phone mandatory by default. Because someone needs it, and who does not need it. Maybe later I'll make such an option in the settings. You can easily add jquery validation code in theme file. JQuery validation is already used for other fields. It would be near perfect if you could add ajax style live search for websites with many custom fields (I think there is only one theme that offers this). Is there an option in settings so that users can search by Country, Region, City in search sidebar? HI. I'll think about it. Perhaps this can be done in future updates.